This is a strong product from Sony – We reviewed this in June 2006 as a replacement to former favourite of ours, the Sony RDR GX210. This updated model improves on the earlier model, now supporting Smartlink, and being much slimmer. It’s a fully-featured dual-format DVD recorder that offers impressive performance, has a good set of connectivity options, and a price-tag of less than £150 (less than you’d pay for some inferior, single-format models). We’ve only had our hands on this model for a few days, and have been using it to record off-air digital TV shows, as well as dubbing over some old video tapes – so far, we’re impressed – it’s pretty easy to use, produces good picture quality, and works very well with our test Sony LCD TV. Top feature for us, was Smartlink – which worked well with our test Bravia LCD set, the KDL-32S2010. Smartlink allows download of tuner preset data from a compatible TV, TV direct record, one-touch play / timer, and automatic power off. One of the strengths of the machine, is its connectivity. It offers two SCART sockets, has a total of three line inputs, and has front-panel access to line in and S Video connectors. It also has a component video out, and a coax digital audio output. After we connected the DVD recorder to the test TV and started it up, we had the option to use Easy Setup, which sets your preferred language, scans for TV signals, sets the clock from over-the-air signals and lets you configure some of the connectivity options. Pretty straightforward, but the we thought some of the questions could’ve been worded a little more simply for beginners. Recording a DVD is pretty straightforward. We’re using the DVD +RW format, with good results. On inserting a blank disc, the Sony performs a quick format, and when we’re ready to start, the record button instantly kicks the machine into record, creating a new title. We like the ‘Auto Chapter’, which creates a chapter marker every 6 minutes. All of the title and chapter markings are editable, to help build a usable DVD menu. When recording, you have the option to chose from one of eight quality options: HQ (High quality) offers 60 minutes of recording time on a 4.7Gb disk, then there’s HSP (90 minutes), Standard (120mins), LSP (2.5 hours), ESP (3 hours), LP (4 hours), EP (6 hours) and Super Long Play (8 hours). The latter, SLP, is pretty grim, but still watchable. The player has a couple of niceties, such as the ability to go to a point using ‘time search’, plus a togglable on-screen counter showing time remaining on a DVD, plus a progress bar. The 120 can also play MP3 files on a disk, including support for folders. Criticisms? Nothing too serious. The RDR-GX120 performs well, runs quietly, and produces good audio and video playback. We did find it slightly sluggish in loading and unloading disks, and in our opinion, the front display is a little hard to read from a distance – although the ‘Display’ button on the remote can be used to call up the display information on-screen. The remote control is OK – a little boxey, but at least it doesn’t have the slide-panel found on the GX210 (which hid half of the controls). It does the job and is well laid-out. The only real gripe we have is that a couple of editing features appear to have been descoped from the GX210 DVD recorder – there’s less control of editing chapters, and there seems to be no option to divide one title into two titles – a feature that we find useful when archiving video tapes onto DVD. If using +RW discs, there is at least the option called A-B Erase, which allows removal of part of a Title (for editing adbreaks, or trimming space at the end of a recording). Looking for general advice on choosing or using a DVD recorder? See our DVD Recorders page, or give our DVD Recorders podcast a listen! 2 SCART sockets (CVBS). RGB output. Each time you start a recording, a Title is automatically created. There’s the option to name or delete a Title, as required. You can also ‘protect’ a title to prevent it from being deleted. With +RW discs, you can also erase a section of a Title (“A-B Erase”). A Title can contain Chapters – there’s a setting to create automatic chapters every 6 minutes. Sadly, there’s no option to create chapters manually during playback. Connecting If you’re having trouble connecting up your DVD recorder, see our Connection page for some general advice (including our interactive connection advisor), otherwise, try asking for help in our forum. Recording The GX120 can record content from the built-in TV tuner, or from equipment that’s connected to it via SCART, S-video or composite connections. As the GX120 has a number of connectors, it’s important to make sure that you set the machine to record the correct video source. If you want to record from an external source, such as a digital TV set-top box, or a VHS recorder, first, make sure you’ve connected the hardware to the DVD recorder, e.g. using a SCART lead (there’s general help on our Connection page). Next, set your TV so that you can see the output of the DVD recorder (as if you’re watching a DVD). Then, on the DVD recorder’s remote control, press the ‘Input Select’ button until you see the appropriate source that you want to record. You should now be on the correct channel to record from the external source, and pressing the Record button will start the recording onto a formatted blank disk. 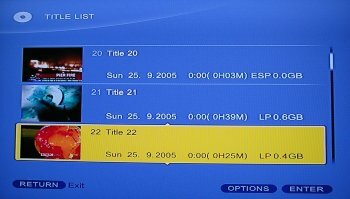 You can also set a timed record from something like a Sky box – When entering the recording details into the DVD recorder, you select the appropriate Line In feed (assuming a SCART connection), then as long as the Sky box is left on the correct channel, the DVD recorder will record the output of the Sky box. Press the Timer button on the remote. Use the right key to move between Day, Start time, End time and channel. With each of these fields, you can use the up/down buttons to change the selection. The Channel field scrolls through the TV channels and the three Line In feeds. When complete, press Enter, then select the ‘OK’ button on the screen to set the recording. See page 38 of the manual if you need more help. We had much more luck with Freeview (Digital TV) subtitles though. We connected a BT iPlayer+ Freeview set-top box to the Sony RDR-GX120 via a SCART socket, and set the set-top box to generate subtitles. We found that the subtitles on the Freeview channels recorded onto DVD as expected – it seems that if your digital TV receiver is capable of outputting subtitles via its SCART socket, then this Sony DVD Recorder will record them via the Line In SCART socket. Multi-region? The standard RDR-GX120 DVD recorder is region-coded. The region code is printed on the rear of the unit. Please do not contact us regarding chipping / hacking of this unit’s region protection. We’ve been asked whether this works through a Line In feed, but the manual doesn’t mention this. Sky / Sky+ We’ve been asked how easy it is to use this DVD recorder with Sky and Sky+ … The good news is that if you want to record shows from Sky, or download recordings from your Sky+ box, this DVD recorder works well. You need to connect a SCART lead from the Sky or Sky+ box into a spare SCART socket at the back of the DVD recorder. There’s no automatic synchronised dubbing option, and you can’t use the DVD recorder to switch Sky channels – but for basic recording from Sky, or transferring of shows recorded onto Sky+, this works nicely. You use the DVD recorder remote control to select the correct Line Input, press ‘record’ on the DVD player remote, then the output of the Sky box is recorded onto DVD. 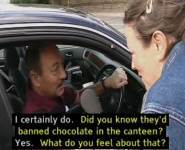 If required, you can pause the recording onto DVD, perhaps to edit out an ad-break. Discs The RDR-GX120 supports recording onto the following recordable DVD formats: DVD+RW , DVD+R and DVD+R DL (Double Layer). JPG Support There’s no mention in the manual of support for JPG files, and the manual explicitly states that Photo CDs cannot be played in the RDR-GX120. Sound The RDR-GX120 has a digital audio out jack, so can be connected to a home cinema system that supports Dolby Digital (5.1 ch), DTS (5.1ch) and MPEG audio (5.1ch) surround. The Audio menu gives you control over the digital audio output types and settings. How can unlocked my dvd player? Why does it say can not play this disc and spits it out? And it Is a Phillips DVD+RW ?